For over a century and a half, combat photographers have taken extraordinary risks to document the true horrors of war. On the morning of February 23, 1945, on the tiny Pacific island of Iwo Jima, a 40-man patrol gathered at the 5th Marine Division headquarters for their final briefing with battalion commander Lt. Col. Chandler Johnson. The Marines had been given a dangerous assignment: Climb 554-foot high Mt. Suribachi, secure the summit, and hoist an American flag when the mission was successfully completed. For the past four days, the Leathernecks had fought a fanatical Japanese Army to seize the all-important mountain. From its peak one could view the entire island. It was imperative that the strategic location be captured quickly to prevent the enemy from shooting down at the advancing infantry heading north to seize the remainder of Iwo Jima. Among the group that day was Staff Sgt. Louis R. Lowery, a photographer with Leatherneck Magazine. As the men began their ascent, Lowery snapped pictures to document the climb. Upon reaching the top, the Marines dispersed and quickly secured the area. Lowery took a picture of the flag raising and decided to go back down the mountain. As he was walking down, he met Joe Rosenthal, an Associated Press photographer. Lowery joked that he had already taken a picture of the flag raising. Rosenthal almost turned around and went back down the mountain, but decided against it. There would be great shots of the island from the top of Suribachi, he thought. He continued his climb. When he got to the crest, Rosenthal saw that the Marines were going to put up a larger flag so that everyone on the island and offshore could get a better view of it. 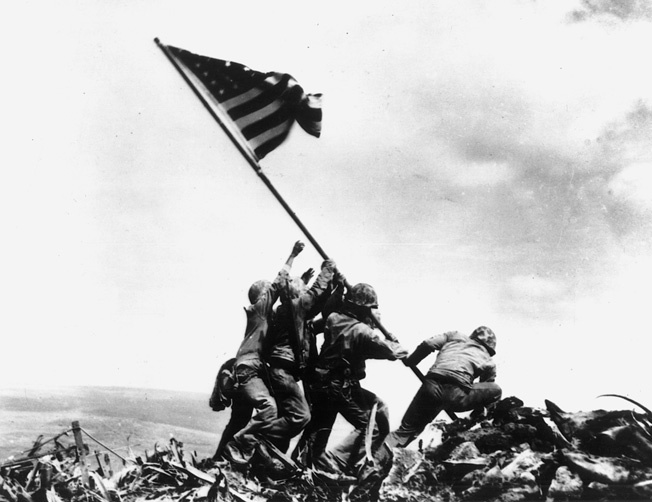 As the five Marines and one Navy corpsman struggled to raise the drainage pipe with the American flag attached to it, Rosenthal snapped a quick photograph. Unknown to him at that moment, he had just taken the greatest war photograph of all time. When it was published in the March 26, 1945, issue of Life magazine, Rosenthal’s photograph, bearing the caption, “The Raising of the Flag on Iwo Jima,” became an immediate icon of World War II. It was used on a postage stamp, in War Bond drives, and on 3.5 million posters. Later, it became the model for the 100-ton bronze monument to fallen Marines at Arlington National Cemetery. In his own modest way, Rosenthal had given a good working description of combat photography, from its inception in the mid-19th century to the present day. Photographers following men at war must depend on their instincts, their technical skill, and a large portion of luck “to bring everything into sharp focus.” When all those elements combine, as they did for Rosenthal at Iwo Jima, the result is a photograph that simultaneously captures the stark reality of the moment while also achieving a mysterious alchemy that raises the image to a work of art and, occasionally, to a symbol for an entire war. 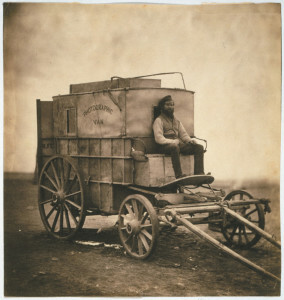 Roger Fenton, photographed with the wagon that carried his photographic equipment. The first photograph was taken in 1827 by a Frenchman named Joseph Nicephore Niepce. He used material that would become hardened when exposed to light, a process that could take up to eight hours to develop. A few years later Niepce collaborated with Louis Daguerre, and the two of them began experimenting with ways to hasten the development process. After Niepce died in 1833, Daguerre continued his experiments. Finally, in 1839, he found a way to reduce the exposure time from eight hours to half an hour. The result of the new process, an image etched on a copper plate, came to be called a daguerreotype. Inevitably, photographers began venturing outdoors to capture more natural scenes. One of the most natural of all human endeavors, unfortunately, is war, and photographers turned to the subject as eagerly as painters had done in the past. The earliest known daguerreotypes of war were taken during the Mexican War, from 1846 to 1848. The only one depicting actual movement, as opposed to studio shots of distinguished officers and obscure soldiers, shows a troop of American cavalry riding down a Mexican street. Another, taken in Exeter, N.H., shows a contingent of New Hampshire Volunteers, swords drawn, following their company band, presumably en route to the far-distant battlefield. Still another shows an American soldier surrounded by Mexican children on the streets of Saltillo. It wasn’t until the Crimean War, a decade later, that a serious effort was made to photograph actual wartime events. An amateur photographer named Gilbert Elliott took a series of prints of the bulwarks surrounding Wingo Sound in the Baltic Sea (the whereabouts of the originals today are unknown). Another photographer, Richard Nicklin, also took numerous photographs. Unfortunately for Nicklin, his photographs, equipment, assistants, and himself were lost at sea when their boat sank after a hurricane tore through Balaclava Harbor on November 14, 1854. 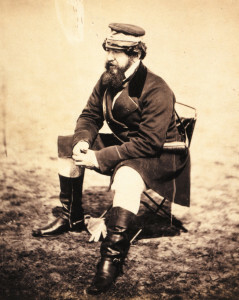 Roger Fenton’s photograph of Crimean War correspondent William H. Russel. Soon, many began to speak out against the costly and unnecessary war. Correspondents such as William Howard Russell of the London Times severely criticized the manner in which the war was being handled. Russell’s reports on the harsh life the soldiers had to endure in Balaclava aroused the sympathy and ire of the British public. It was then that Thomas Agnew of Thomas Agnew and Sons Publishing made a proposition to the British government. He offered to send someone to the Crimea to prove that Russell and other reporters were wrong in their condemnation of the war. He would provide photographs to support his point. In 1855 Agnew sent Roger Fenton to the Crimea to photograph the war. Fenton, a failed painter and portrait photographer who had often photographed the royal family, chose not to take pictures of any scene that might upset the public. Armed with a letter of introduction from Queen Victoria’s consort, Prince Albert, Fenton traveled freely through the camps, concentrating on scenes of well-ordered military discipline and design and avoiding anything that might depict the war in a negative fashion. Fenton took many photographs, 360 in all, that showed smiling, well-dressed officers eating, drinking, and smoking in camp, while any scenes of actual squalor, death, and disease were strangely missing. Fenton managed to lie by omission—and sometimes by commission, as well. His most famous photograph, “The Valley of the Shadow of Death,” showed what purported to be the site of the British cavalry’s famously gallant, if misbegotten, charge of the Light Brigade. Modern research has shown the site, a gully littered with spent cannonballs and scattered boulders, to have been a harmless gully near Sevastopol. Ironically, Fenton did come upon the true site of the charge and graphic evidence of what the war was really like. In a letter home, the photographer described his findings: “We came upon many skeletons half buried. One was lying as if he had raised himself upon his elbow, the bare skull sticking up with still enough flesh left in the muscles to prevent it falling from the shoulders. Another man’s feet and hands were out of the ground, and shoes on the feet and the flesh gun.” Fenton did not even bother to unpack his camera. The public back home did not need to see such things, and the queen and prince might be displeased. 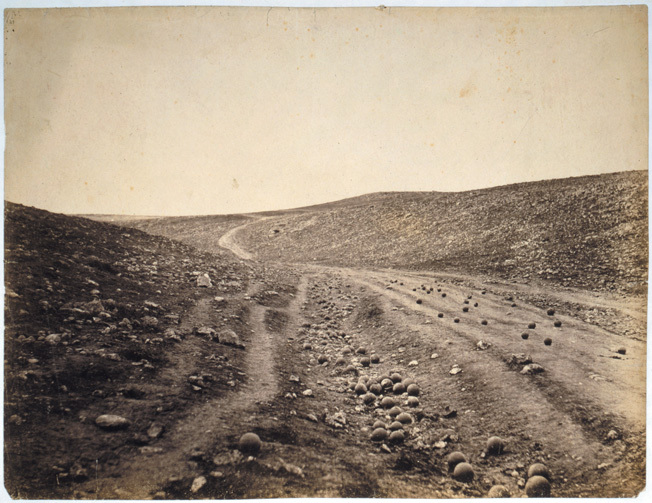 Roger Fenton’s phtograph of a Crimean gulley littered with Russian cannonballs was misidentified as the site of the Charge of the Light Brigade. The Crimean War may have soured British opinion on war in general, but it did not deter photographers from covering future conflicts. One year after the conclusion of the war, another opportunity arose to capture the reality of war, and this time someone was up to the challenge. In 1857, the native soldiers of the East India Company, known as Sepoys, rose up against their British rulers. There were many reasons why the rebellion started: the Indian soldiers were not pleased with serving with other castes, their low pay, or their deployment to Burma. The final straw that led to the uprising was the introduction of the Enfield Pattern 1853 rifle. The weapon’s .577-caliber cartridge had to be manually loaded, which required biting off the end of the paper cartridge to pour the contents, powder and Minié ball, down the barrel. The cartridges were widely and erroneously rumored to be greased with pig fat and beef tallow, both of which are forbidden to be eaten under Hindu and Muslim law. In an attempt to diffuse the situation, the British government replaced the supposedly tainted rounds and used beeswax and vegetable oil as a substitute for the pork and beef. Rumors, however, persisted among the Sepoys that the rounds were still contaminated. General George Anson, commander-in-chief of the British forces, arrogantly proclaimed, “I’ll never give in to their beastly prejudices.” What followed was a bloody war that lasted over a year. Horrendous atrocities were committed on both sides, and hundreds of innocent civilians were killed in the fighting. However Beato composed the shot, the Secundra Bagh photograph, plus another showing the hanging bodies of two executed Sepoys, shocked a mid-Victorian-era nation that had never seen such horrors before. Beato continued to photograph the remains of dead soldiers (never, however, would he photograph deceased British or Allied military personnel). In 1860, he traveled to China, where the French and British were fighting the Chinese in the Second Opium War. After the defeat of the Chinese at Taku Fort, Beato arrived on the scene and was ecstatic with what he saw—the bodies of mangled Chinese soldiers around an exploded magazine. Beato, by all accounts, began running around with “great excitement,” pleading with people not to disturb the bodies “until perpetuated by his photographic apparatus.” It was the first picture showing actual dead bodies immediately following a battle. Beato’s voluminous works constitute the first efforts of a photographer to actually illustrate the horrors of combat, even if they only showed the enemy dead. This would eventually be known as photojournalism. The bloated corpses of Federal soldiers litter a field at Gettysburg in Timothy O’Sullivan’s aptly-titled photograph Harvest of Death. Besides such familiar, homey pictures, the Civil War photographers also captured unprecedented grisly scenes of death and destruction on the numerous battlefields of the conflict. The best-known of the photographers was Mathew Brady who, with President Abraham Lincoln’s approval, employed a group of photographers to travel the various camps and battlefields to photograph the war from the Union side. In all, Brady’s team took over 7,000 negatives. From these talented men—individuals such as Alexander Gardner, John Rookie, and Timothy O’Sullivan—came hundreds of photographs depicting the horrors brought about when modern technology met outmoded tactics. One such photo, taken by O’Sullivan, showed the twisted and lifeless bodies of dead Union soldiers at Gettysburg in 1863. He named it, all too aptly, “Harvest of Death.” Another macabre scene was the wounded awaiting treatment after the Battle of Chancellorsville in May 1863. 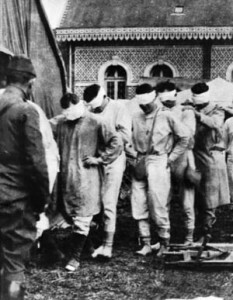 One man is sitting with his left forearm missing and another is on a stretcher after his left foot had been amputated. The horrific casualties of the fratricidal war were being presented to the American people for the first time. The Civil War became the most photographed war in history, and its images are ineradicably buried in the American psyche. The great generals—Ulysses S. Grant, Robert E. Lee, William Tecumseh Sherman, Thomas “Stonewall” Jackson—still stare at us across the veil of centuries, but it is the common soldiers who reflect the true meaning of the war in all its innate, homespun nobility. 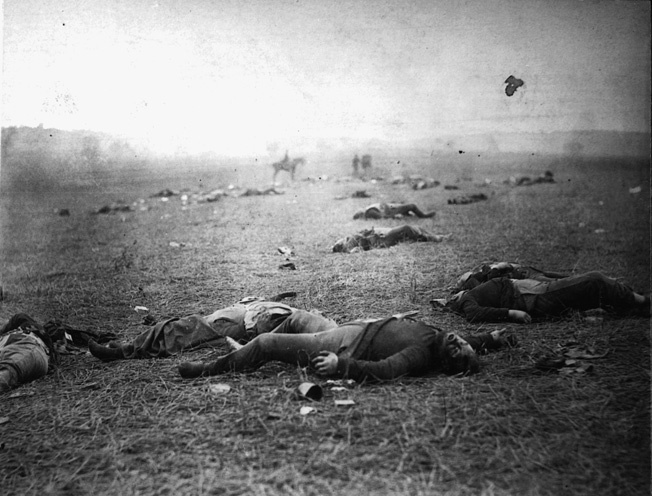 Whether living or dead, posing for the camera in their battle finery or lying obscenely broken on a battlefield that was someone’s farm the day before, the Civil War soldiers haunt a particular place in the American psyche. Photography greatly influenced the American people during the nation’s next great war, the Spanish-American War of 1898. Famed newspaper publisher William Randolph Hearst sent battalions of reporters to Cuba to cover the growing insurrection against Spain, a conflict Hearst strongly believed the United States should become involved in. Newspaper sketches and accounts of real and imagined atrocities being perpetrated against Cuban peasants aroused the sympathy of the American people, although much of what was written or sketched was patently false. Noted illustrator Frederic Remington, sent by Hearst to Cuba, was not impressed by the supposedly revolutionary conditions there—he found the country quite serene. He reportedly wired Hearst: “There is no trouble here. There will be no war. I wish to return.” Hearst shot back: “Please remain. You furnish pictures. I will furnish war.” Whether or not the exchange actually took place, it perfectly encapsulates the press’s role in fomenting and cheerleading the completely unnecessary war. When the battleship USS Maine exploded under mysterious circumstances in Havana Harbor in 1898, Hearst got his wish—the United States was once again involved in a war, one that would be covered extensively by both journalists and photographers. Numerous officers and military leaders took the opportunity to have themselves photographed during this period, most notably Theodore Roosevelt, who became a colonel of the famous volunteer regiment known as the Rough Riders and, with the help of a convenient assassin, subsequently rode his fame all the way into the White House. 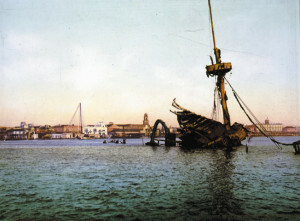 The USS Maine lies scuttled in Havana Harbor in William Henry Jackson’s photograph. Spanish-American War photographers, who were vastly outnumbered by their print counterparts, faced a number of hardships in covering the war. The size of their cameras, ranging from 12-by-20 inches to 5-by-7 inches, was a constant problem. Most cameramen agreed with Collier’s photographer Jimmy Hare that the smaller the camera the better, since the war required constant movement through a jungle-like, steamy countryside. The lack of mobile darkrooms was also felt; Hearst foresightedly provided an off-shore yacht for his photographers to use. The bright tropical light, dense foliage, and frequent rain also interfered with the photography process. The Spanish-American War was perhaps the last gentleman’s war, and most photographers consciously chose to adhere to traditional standards of behavior. Despite a lack of organized censorship on the part of the military, the photographers generally refrained from photographing dead American bodies. Burr McIntosh of Leslie’s Illustrated Weekly chose not to uncover the body of slain Rough Rider Hamilton Fish, Jr., who had been killed in an ambush at Las Guasimas. He did, however, take a photograph of the canvas-shrouded Fish’s corpse laid out alongside that of a private named Stevens, while less than 15 feet away Theodore Roosevelt and other regimental officers joked and ate lunch, oblivious to the dead men. Collier’s did not publish the picture, which might have done great damage to Roosevelt’s future political career, although a second shot of the two bodies alone, with Fish’s hobnailed boots protruding from the end of the blanket, became one of the most celebrated photos of the war. In addition to photographs, a relatively new invention, moving pictures, was also used for the first time to chronicle events during the Spanish-American War. Several fledgling motion picture companies arrived in Tampa, Fla., to document the war, including the Edison Manufacturing Company, owned by the renowned inventor Thomas Alva Edison, and the Biograph Company. Like Hearst and his publishing rival Joseph Pulitzer, who sought to increase circulation of their newspapers by offering sensational journalism, the film companies wanted to capitalize on the public’s appetite for war news. Cameraman William Paley was working for Edison when he was hired by the New York Journal, a Hearst newspaper, to film the war. He caught the activity of camp life while in Tampa, the drilling and maneuvers that went with the boredom of stateside duty. He then traveled to Key West to film the military funeral of the dead from the Maine disaster. From there he went to Cuba to capture the wreckage of the damaged battleship still floating in Havana Harbor. He also photographed Cubans, called reconcentrados, who had fled their country after being incarcerated in concentration camps by the Spaniards. When the American troops began to leave Florida, Paley was there to film their departure as well. Johann Wilhelm “Billy” Bitzer was another filmmaker who went to Cuba during the war for the Biograph Company. While there, he filmed the aftermath of the defeat of the Spanish at Santiago Harbor in July and wounded American soldiers being evacuated in boats following the battle of Las Guasimas. Unfortunately, both Bitzer and Paley were stricken with fever and were forced to return to the United States after a brief stint in the war zone. Due to the awkward and bulky equipment carried by the photographers and filmmakers, the actual battles were not filmed. Instead, Edison chose to film reenactments of these events at his studio in the wilds of New Jersey. Utilizing National Guard soldiers, he shot numerous battle sequences. One of his most notable was entitled “U.S. Infantry Supported by Rough Riders at El Caney,” a glamorized rendition of the battle. As quickly as the Spanish-American War started, it was over. But one unforeseen result was that the United States acquired the Philippines from Spain. Before long, the nation was immersed in another war, this time in a native-born insurrection. From 1899 to 1902, the U.S. military fought a bloody and increasingly unpopular conflict with Filipino rebels. Photographers once again tried to capture the essence of the day-to-day soldier’s life and the harsh terrain of the archipelago. Such photographs included one of the 28th U.S. Volunteer Infantry destroying Fort Siray on the island of Mindanao in 1901. Another portrayed a lighter side of the conflict, with a youthful group of cavalry troopers posing around a water buffalo while one of their comrades perched atop the beast. Still another depicted the ferocity of the Moros, as the rebels were called, when two of the insurgents were caught by the camera armed with krises, sharp-edged knives. Events in Europe, however, would soon overshadow the Philippine War. On June 28, 1914, Austrian Archduke Franz Ferdinand and his wife Sophie were traveling by motorcade in Sarajevo, Yugoslavia. The couple was there to celebrate St. Vitus Day, a national holiday in the Balkans, in conjunction with their 14th wedding anniversary. The Balkans were a hotbed of nationalistic intrigue in 1914. The Bosnian Serbs living in the southern part of the Austro-Hungarian Empire wanted to be part of Serbia. Austria, having officially annexed the region in 1908, did not want to concede any part of its kingdom. On that fateful day, a bomb was thrown at the archduke’s vehicle. He quickly deflected it, but the resulting explosion injured several people in another car, and a stray piece of shrapnel struck his wife’s face. When Ferdinand insisted upon going to the hospital to visit the injured parties, he and his wife were killed by bullets fired by 19-year-old Serb nationalist Gavrilo Princip, who happened to be standing in wait when their car took an inopportune wrong turn. (There are no photos of the shooting itself, but one shows Princip being wrestled into submission by police immediately afterward.) Princip’s act plunged Europe into World War I and four years of bloody combat whose horrors were relentlessly documented for posterity by a small army of photographers. American victims of poison gas shuffle blindly through a french hospital courtyard during World War I.
Censorship played a huge part in the war. British correspondents were directed to write only positive and upbeat stories to keep the public from understanding what was really transpiring on the battlefields. One artist remarked bitterly, “I am not allowed to put dead men into my pictures because apparently they do not exist.” With the exception of the official photographers, anyone caught with a camera would be shot. Private F.A. Frye, a press photographer prior to the war, nevertheless hid one in his tunic and took a photo of the dawn assault at Loos in 1915. Because of the censorship, there was not one photograph of American dead published during World War I, although Jimmy Hare of Leslie’s Weekly managed to take a grisly photo of a dead German soldier whose body had been sprinkled with lime disinfectant to prevent the spread of disease. Another Leslie’s correspondent, Lucian Kirtland, took the most graphic photograph to appear in a major American publication during the war when he visited the Lorraine front in May 1918. Kirtland’s photograph, “War’s Skulls and Crossbones,” showed a moldering collection of German skeletons and skulls littering an abandoned trench. “Death evens all scores,” the caption noted. 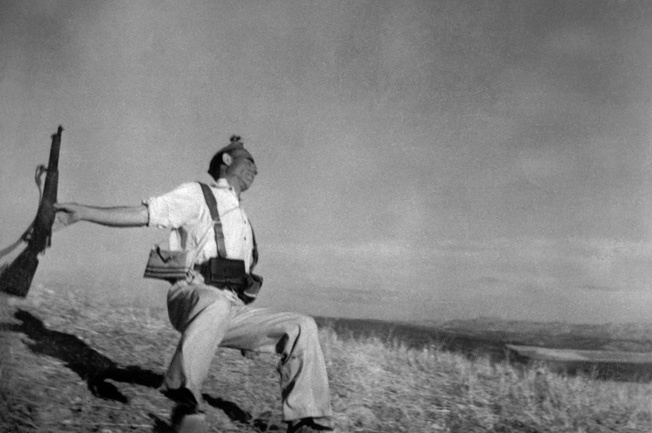 Spanish loyalist Frederico Borrell Garcia is captured at the moment of his death at Cerro Muriano by photographer Robert Capa on September 5, 1936. Capa’s Falling Soldier remains the most controversial war photo in history. In the years immediately preceding World War II, photographers wandered the globe in search of dramatic events to document, and war was always at the top of their lists. Robert Capa was one such individual. Capa was born Ernest Friedmann in Budapest, Hungary, in 1913. He changed his name to Robert Capa because it was close to the filmmaker Frank Capra’s name and sounded more American than his own Hungarian moniker. While covering the Spanish Civil War, Capa happened to be accompanying a party of Loyalist militiamen near the village of Cerro Muriano, eight miles north of Cordoba, on the afternoon of September 5, 1936. In the lengthening shadows on an obscure hillside, Capa was crouching in a gully behind the men when Fascist rebels suddenly opened fire with a machine gun. Instinctively snapping his camera, the photographer captured perhaps the most iconic—and controversial—war photo in history. It shows, or purports to show, a soldier falling backward at the instant of his death. Nearly 70 years later, the actual truth of the photograph is still being debated. On December 7, 1941, Japan’s surprise attack on Pearl Harbor plunged the United States into yet another world war. Whenever the various branches of the military ventured into battle, photographers and film crews, both military and civilian, would soon follow. In the beginning, the government imposed censorship to keep the horrific images of war from the public. However, after viewing Life photographer George Strock’s photo of three dead American soldiers sprawled in the sand on Buna Beach, New Guinea, President Franklin Delano Roosevelt changed his mind. The graphic photograph, slugged “Here Lie Three Americans,” ran in the magazine’s September 20, 1943, issue. Identifying the middle soldier as “Bill, the Wisconsin boy,” Life editorialized, “If Bill had the guts to take it, then we ought to have the guts to look at it.” Subsequent newsreel footage of dead Marines washing ashore at Tarawa in November 1943 was shown in theaters across the country. The American people were shocked; most had never experienced the sickening scenes of the aftermath of a battle. Roosevelt’s decision reaped some benefits—the sale of War Bonds increased dramatically—but enlistments dropped by 35 percent. When the Allies invaded France on June 6, 1944, Robert Capa went ashore with the first wave of infantry on Omaha Beach for Life magazine. When he had exhausted all his film, Capa attempted to put in more to take additional shots, but his hands were trembling so badly he couldn’t reload the camera. “It was a new kind of fear shaking my body from toe to hair,” he would later explain. Ironically, a young Larry Burrows, later to become one of the best photographers during the Vietnam War, accidentally damaged most of the prints when he left them in the drying cabinet too long and they became overheated. The ones that survived were, as Capa put it, “a cut-out of the whole event.” The pictures showed American infantrymen wading ashore and trying to find cover from the murderous German artillery and automatic weapons fire. The most famous photo, “Crawling Through the Water,” blurred and grainy, showed a single gritty American heading directly into the German gunfire. His expression, grim and resolute, captured the essence of the D-day landing, and indeed of the entire American war experience—a dirty job from start to finish, one to be endured and survived, but not glorified. 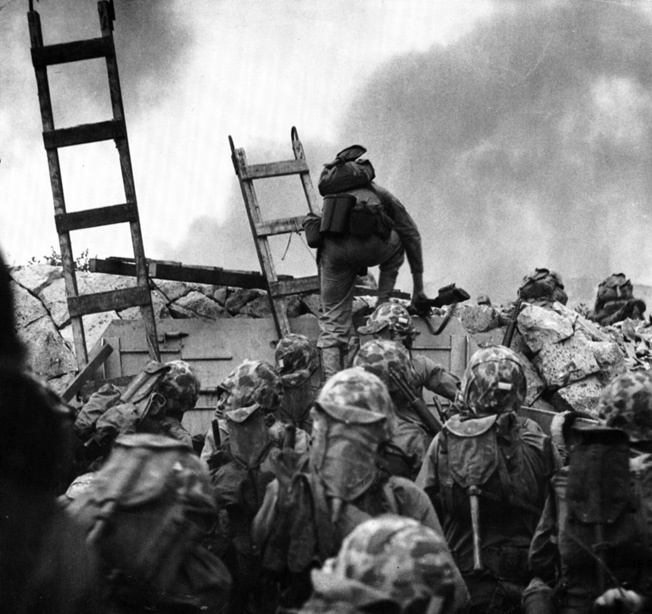 First Lieutenant Baldomero Lopez leads U.S. Marines over the seawall at Red Beach during the audacious landing at Inchon on September 15, 1950. Lopez was awarded a posthumous Medal of Honor for throwing his body on a grenade to shield his men. With the end of World War II, it would be hard to imagine that in a mere five years the United States and many other nations would become embroiled in another conflict—this time on the Korean Peninsula. On June 25, 1950, over 90,000 North Korean troops swarmed across the 38th parallel and invaded South Korea. The United Nations rushed troops and supplies to the beleaguered country to stem the flow of the communist advance. Journalists and photographers quickly followed. David Douglas Duncan of Life magazine was one of the best-known photographers to cover the Korean War. His photographs stunned his editors and peers with their artistry, power, and quality. One such picture showed a mud-covered Marine corporal leaping over the body of a dead North Korean soldier as he is moving through a ditch avoiding enemy machine-gun fire. Duncan took it in September 1950 during the fight for the Pusan perimeter. Another, taken two months later, showed a weary Marine laboriously hacking his breakfast out of a frozen tin of beans. When Duncan asked him what he wanted for Christmas, the Marine said simply, “Give me tomorrow,” and went back to chopping away at his beans. With the Eighth Army heavily engaged, General Douglas MacArthur, commander-in-chief in Korea, decided on a bold move. He would land elements of the 1st Marine Division at the port of Inchon, known for its dangerous tides and seawalls. Despite the pleas from his staff to choose another landing site, MacArthur stood firm. On September 15, 1950, the assault commenced. A combat photographer snapped First Lieutenant Baldomero Lopez of Company A, 1st Battalion, 5th Marines, scaling the seawall that day. It became one of the most enduring photos of the war. A short time later, Lopez would throw himself on a grenade to save the lives of his men. He would be given a Medal of Honor posthumously. That November, Allied forces became involved in the controlled flight from the Chosin Reservoir. Photos and film showing retreating soldiers and Marines braving the bone-chilling Korean winter with its sub-zero temperatures shocked the nation. For the next three years, the camera would follow the various units as they fought the Koreans, and the Chinese Army, to a stalemate. Finally, on July 27, 1953, an armistice was signed ending hostilities. During the decade following the end of the Korean Conflict, the United States became increasingly involved with supporting the government of South Vietnam. After the French were defeated at Dien Bien Phu in 1954 by the Communists, the country was divided at the 17th parallel between North and South Vietnam. By the late 1950s, North Vietnam began sending men and supplies down the Ho Chi Minh Trail (named after the Communist leader) to its troops stationed there and in neighboring Laos and Cambodia. The American presence grew slowly but irresistibly during the next decade. As the violence escalated, President Lyndon Johnson sent in more American troops, and by 1965 the United States found itself ensnared in another land war in Southeast Asia. 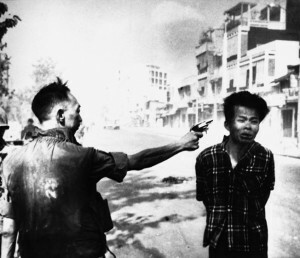 Eddie Adams’s Pulitzer Prize winning photograph, depicting the horrifying execution of a Viet Cong officer by Brig. Gen. Nguyen Ngoc Loan during the Tet offensive, helped turn the American public against the Vietnam War. Often, the power of the Vietnam War photographs depends on how they are interpreted. For example, in the spring of 1972, during the Communist Easter offensive in South Vietnam, a now-infamous picture was taken by Nick Ut of the Associated Press. It shows a naked Vietnamese girl named Kim Phuc fleeing down Highway One. Her clothes had been completely burned from her body by napalm dropped from airplanes. The anti war movement quickly used the event to criticize the indiscriminate use of American firepower against innocent civilians. The truth was that the napalm had been dropped by a South Vietnamese A-1E Skyraider, and some of the jellied substance inadvertently struck a crowd of civilians. There were no American aircraft in the area at the time. Haunted by the images of dead and wounded Marines being transported from the Battle of Hué City atop an M-48 tank in February 1968, the siege of the Marine base at Khe Sanh, and the weekly death toll and flag-draped coffins arriving back in the country on a daily basis, the American public finally soured on the war. A peace treaty was signed in January 1973 in Paris, officially ending the war. A little over two years later, however, the Communists would launch another offensive to unify the country. The unforgettable photos of the helicopters leaving the roof of the embassy, South Vietnamese civilians desperately trying to climb the fence into the safety of the embassy compound, and pushing South Vietnamese helicopters off the side of U.S. aircraft carriers were a painful reminder of the Vietnam experience. Tags Abraham Lincoln, Allies, Axis, Battle of Antietam, Battle of Chancellorsville, Battle of Chosin Reservoir, Battle of Gettysburg, Battle of Iwo Jima, Chosin Reservoir, Cold War, Crimean War, Franklin D. Roosevelt, Franz Ferdinand, General Douglas MacArthur, Ho Chi Minh Trail, Iwo Jima, Japan, Japanese, Joe Rosenthal, Korean War, medal of honor, Moros, Pacific Theater, Pearl Harbor, Philippine Insurrection, Roger Fenton, Second Opium War, Sepoy Mutiny, Spanish Civil War, Spanish-American War, Tet Offensive, United States Marine Corps, Vietnam War, William Randolph Hearst, William Russell, World War I, WWII.